I love Halloween – Why? Well, it’s the precursor to the “holidays” and, in recent years, it has been the harbinger “of sleep...” that we will be reclaiming that hour of sleep we forfeited in the spring. Besides the candy, it’s a seasonal invitation to let one’s creativity abound—thinking of the infinite number or character or costume possibilities. Most fitting, I suppose that this is the season when two of our regions newest icons have been introduced: “Gritty” representing the Philadelphia Flyers and “Squiggles” the new face of the Please Touch Museum. Whether you love ‘em or not, mascots have power – ﻿as Webster says… to bring them good luck. 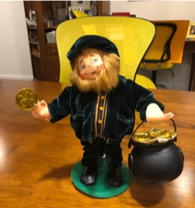 So, this seems like the right moment to say that we at Dunleavy have a mascot and we’d like to introduce you to him… his name is Seamus O’Dunleavy. Seamus is small but he has mightily magical powers... he generously showers good luck on our team by bringing wonderful new organizations into our orbit every day. This month Seamus’s magic brought us Special Olympics Pennsylvania, Share Food Program, Philadelphia Aquatic Center, Wissahickon Valley Public Library, Neighborhood Gardens Trust and Washington Memorial Heritage. Here’s to a happy Halloween and more magic from our favorite leprechaun Seamus (who some have observed looks like Gritty’s irish cousin)! Are you a female board member or executive director looking for new ideas, talent, treasure and a larger network? Join us on April 11th! Learn more here. Congratulations to our 2017 VIV Award Recipients! Many thanks to each and every organization that shared a volunteer story with us! We were thrilled by the number of submissions we received for our inaugural VIV (Very Important Volunteer) contest and enjoyed reading about the inspiring men, women and children who give their most valuable resource (their time) to help others. We are pleased to announce our 2017 VIV Award Recipients! "I've had the pleasure of working for the past four years with Clarence Clark, RN, a volunteer for 18 years at Jefferson's Methodist Hospital in Philadelphia. It is an honor and privilege to call this remarkable man my friend. Clarence is a true "Hidden Figure." Once turned away from nursing school for the color of his skin, Clarence went on to be a successful military nurse in the Army for over 3 decades. At 84, he volunteers at Methodist's Emergency Department, and has been pleased to assist the nursing assistants and nurses getting beds ready, running for linen and other things to help the ED run efficiently. Two years ago, Clarence accepted Jefferson's invitation to be a part of its inaugural Patient & Family Advisory Council. You see, he not only is a nurse, but he was also a patient on a number of occasions at Jefferson, and saw it as an opportunity to give feedback and suggestions to the Senior Leadership at Jefferson through the Council. Most recently, I received a frantic call from a total stranger. It was from a desperate man who lived about 4 hours away from Philadelphia. He wasn't even a patient at Jefferson. Rather, this person was receiving lifesaving ketamin-booster kidney infusion at another provider. It was only one of six such centers in eastern part of the US to offer this modality to help save his life. The man was alone in the world and despite many attempts with the other provider, could not get assistance when coming into Philadelphia to get to and from the treatment from his hotel room. I immediately thought of Clarence since he was a former nurse. I didn't promise the man anything, but thought maybe Clarence could help. Clarence, being Clarence, accepted the responsibility immediately. In February, and just this month in early April, Clarence met the man at the Greyhound bus terminal, took him to his treatment, transported him to his hotel, picked him up the next day and repeated the process, and took the man back to the bus terminal to return home. All at his own expense. This may not seem too overwhelming to most people. But, the fact that Clarence is 84 does make it extra special. He's a man of such warmth, duty and honor, that when I saw this opportunity to celebrate him during April's Volunteer month, I couldn't help myself. Clarence is truly a remarkable person who is so deserving of this honor." "Pat is such an essential part of our programs that we would not know what to do without her. As a college adviser and education expert, she has a truly special gift for guiding the women and mothers in our programs through the jungle of educational opportunities while empowering them to take charge of their lives and gain long-term financial security. Eileen came to us 6 years ago when she was in danger of losing her home, while she was battling a brain tumor and unable to work. We supported her in gaining housing security and Pat has been working closely with Eileen and her daughter Katie. Together, they visited college campuses, secured a scholarship and Katie is now studying in Philadelphia. Pat worked tirelessly to open doors for Katie that would have stayed closed otherwise. Many of the women in our programs are overwhelmed by the complexity and cost of the educational system. Pat takes down these barriers one by one. Her volunteerism has a direct impact on ending generational poverty in our county." "Here at Quest Therapeutic Services we serve an average of 85 children a month and our volunteer base is just as large. Every one of our volunteers fills my heart, but a few of them render me without words. One of those volunteers is named John Floyd. The ongoing list of efforts made by Mr. Floyd to engage-in, support, and promote Quest Therapeutic is extensive. Every week for over five years now, he provides a minimum of 4 hours of direct service to our therapists and children. That is over 1,000 hours of service! He also attends, on his own accord, other volunteers’ trainings just so he can “continue to improve his skills with the horses.” He actively seeks guidance and often provides valuable feedback. That is just the tip of the iceberg for John. Twice a year he puts his sales experience and enthusiasm for Quest to good use and attends a volunteer fair where he helps recruit new students to join our team. Before the fair, he stops in at Quest several times to obtain special flyers that he distributes around campus. By the time we arrive at the fair it seems that half the student body already knows who we are. Since he joined our team, he has easily tripled our sign-up at the fairs and stabilized our volunteer base. Anybody in a non-profit knows the immense gift of a solid volunteer base. John was a key factor in that happening for us. As if that isn’t enough, there is more! His fervor for Quest has led him to present to local business organizations to aid us in finding financial sponsors for our ponies. He talks about the great work we are doing for children everywhere he goes and frequently stops in to refill his supply of promotional materials. If you think his loving kindness is filled to the brim –you’re wrong. His kindness spills over even to our staff. On a regular basis, he treats a staff member to a free lunch, just to say thank you for our work here. “Wait, shouldn’t WE be thanking HIM?” You might ask - and we do, with every effort he makes. At this point, the words ‘thank you,’ don’t seem like enough. I cannot think of a better way to show him our gratitude than to nominate him for this award. John is more than a VIV. John is an extraordinary human being with a heart that keeps on giving, and I hope that your judges will agree. Thank you so much for your time and these important recognitions of outstanding community members."